Riverside, Iowa – Sean McCarty of Brown Deer Golf Club has won the 2018 Omega Iowa PGA Player of the Year with a total of 2,091.75 points. This marks the second straight year McCarty has won the Iowa PGA Player of the Year, and the seventh time in the last 10 years he has accomplished this feat. The back-to-back Iowa PGA Player of the Year finished T2 at the 51st PGA Professional Championship back in June at Bayonet and Black Horse in Seaside California, which qualified him for the 100th PGA Championship. McCarty missed the 36-hole cut at the 100th PGA Championship at the Bellerive Country Club. His second-place finish at the 51st PGA Championship also qualified him for the 52nd PGA Professional Championship taking place April 28-May 1, 2019 at the Belfair of Bluffton, South Carolina. McCarty also earned an exemption into the 2018 John Deere Classic after advancing through the pre-qualifier event, where he finished T4, and the open-qualifier event, where he finished T2, to secure one of the five qualifier spots for the John Deere Classic. McCarty made the 36-hole cut after recording a two-day total 3-under-par 139, but would miss the 54-hole cut on Saturday. McCarty competed in 15 Iowa PGA events this season. He had 11 top-five finishes including wins at the Brad Wuhs Pro-Pro, Junior Academy Stroke Play, Boy Scouts Pro-Am, Pro-Junior and the Fall Education and Pro-Pro. McCarty also finished second at the Iowa PGA Professional Championship. Riverside, Iowa – Joe Butler of the Burlington Golf Club has won the 2018 Omega Iowa PGA Super-Senior Player of the Year with 880 points. This marks the second straight season Butler has won the Iowa PGA Super-Senior Player of the Year. Butler competed in 10 Iowa PGA events this season. He won seven of the nine Super-Senior Divisions in the events he played in. Butler was the top Super-Senior finisher at the Iowa PGA Pro-Junior, Iowa PGA Professional Championship, Iowa Senior PGA Professional Championship, the Iowa PGA Pro-Scratch/Pro-Senior Scratch, the Iowa PGA Pro-Senior, the Fall Education and Pro-Pro and the NB Golf Cars/M&M Golf Cars Shootout. The back-to-back Iowa PGA Super-Senior Player of the Year also finished in the top-10 at six events in the Open Division, including an eighth-place finish at the Iowa PGA Professional Championship and a seventh-place finish at the Iowa Senior PGA Professional Championship. 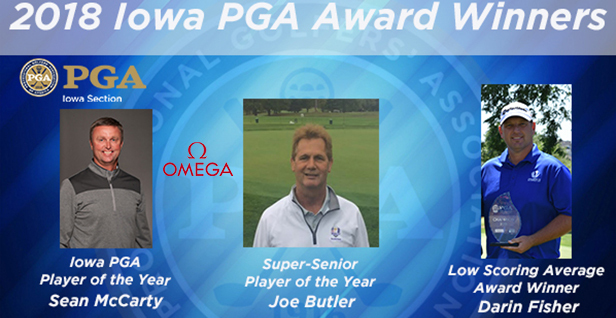 With this award, Butler becomes the first Iowa PGA Professional to win back-to-back Iowa PGA Super-Senior Player of the Year honors since Bob Moreland in 2013-2014. Riverside, Iowa – Darin Fisher of the Preserve on Rathbun Lake has won the 2018 Iowa PGA Low Scoring Average with an average of 70.25. This marks the second time Fisher has recorded the Low Scoring Average in the last three years. Fisher played in 12 Iowa PGA events this season, finishing inside the top-five at eight events, including five second place finishes and victories at the Iowa PGA Professional Championship and the season long Iowa PGA Match Play. Fisher earned exemptions into the 52nd PGA Professional National Championship that takes place April 28-May 1, 2019 at the Belfair of Bluffton in South Carolina and the 2019 John Deere Classic with his win at the 2018 Iowa PGA Professional Championship. 78 birdies in 2018. Fisher averaged 4.33 birdies per round and totaled eight rounds in the 60s this year. The 2018 Iowa PGA Assistant and Senior Players of the Year are to be determined. The Assistant Player of the Year will be announced following the completion of the 42nd National Car Rental Assistant PGA Professional Championship, which takes place at the PGA Golf Club in Port St. Lucie, Florida on November 15-18. The Iowa PGA Senior Player of the Year will be announced next week following the conclusion of the Senior PGA Professional Championship, which takes place October 25-28 at the PGA Golf Club in Port St. Lucie, Florida.